Cardiovascular disease (CVD), which is often due to or combined with atherosclerosis and infectious complications, is the main cause of death in patients with chronic kidney disease (CKD) (1,2). A number of traditional, novel, and uremia-specific risk factors coexist in CKD and contribute to the increased cardiovascular risk in CKD population (1). Poor oral health, which is related to advanced age and diabetes mellitus, may constitute an under-recognized novel risk factor, because recent studies have shown how periodontitis associates with coronary heart disease and cerebrovascular disease in the general population (3) as well as in hemodialysis (HD) patients (4). A plausible explanation would involve bacterial pathogens causing peridontitis, leading to systemic inflammation as induced by lipopolysaccaride coats and thus triggering atherogenesis, thrombus formation, and platelet aggregation (5). However, periodontal diseases are treatable and modifiable risk factors (6,7). Furthermore, novel links between manifestations of poor oral health and systemic complications in CKD such as protein-energy wasting (PEW), infections, and atherosclerotic complications are being established (Figures 1 and 2). In this review, we explore these links and possible measures to tackle these problems. Hypothetic model for how peridontitis may act as a potential cause of local and systemic inflammation in chronic kidney disease patients. SAA, serum amyloid A; CRP, C-reactive protein; MMP, matrix metalloproteinase. 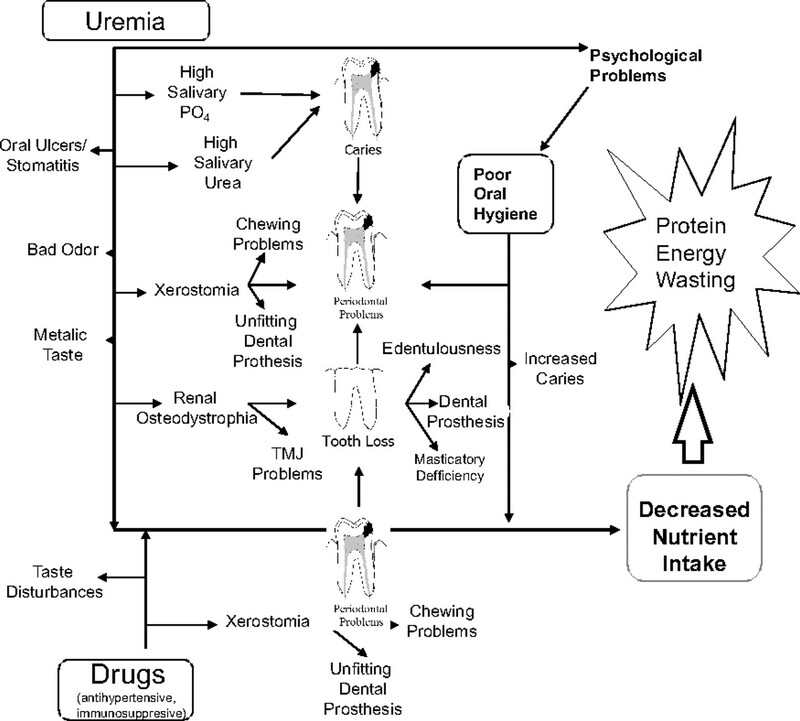 Possible contribution of poor oral health in uremia to reduced nutrient intake and protein-energy wasting in chronic kidney disease patients. As a consequence of a number of uremic metabolic, endocrinological, and immunological imbalances, CKD patients suffer from numerous systemic complications that may contribute to poor oral health (8). Although there are no specific signs in the oral cavity indicating the presence of CKD (9), a whole range of changes occur in the oral cavity that are associated with CKD itself or with the CKD therapy (10,11) (Figure 3). Indeed, CKD has been reported to affect the teeth (9,12–15), oral mucosa (10,16–20), bone (11,12,21–26), periodontium (27–30), salivary glands (17,31,32), tongue (10,33), mouth cavity (34–36), and temporomandibular joint (37). Common orofacial problems associated with chronic kidney disease itself or caused by therapy. Several studies have demonstrated higher rates of oral pathology in dialysis patients (16,17,27) with one or more oral symptoms (17,35,38) such as xerostomia, taste disturbances, uremic odor, tongue coating, mucosal inflammation, mucosal petechia/ecchymosis, oral ulceration, or enamel hypoplasia (16,36,39). Xerostomia (or dryness of the mouth) may predispose to caries and gingival inflammation as well as contribute to difficulties with speech, denture retention, mastication, dysphagia, sore mouth, loss of taste, and infections (40). CKD patients are also often prone to retrograde parotitis, which is believed to result from a combination of direct gland involvement, chemical inflammation, side effects of drug therapy, dehydration, and mouth breathing (34). Patients with renal failure often complain of an ammonia-like bad odor, perhaps because of the high urea content in saliva and its subsequent breakdown to ammonia. Increased dental calculus has been observed, perhaps as a consequence of a high salivary urea and phosphate levels. Interestingly, however, the antibacterial effect of urea may also be responsible for a lower caries rate as reported in HD patients (28,35). A spectrum of oral mucosal lesions, including white and erythematous patches and/or ulceration, lichen planus-like disease, oral hairy leukoplakia, histopathologically similar lesions to Epstein-Barr virus, macules, nodules, and non-Hodgkin's lymphoma and/or Kaposi's sarcoma, has been described in dialysis patients and in kidney transplant recipients secondary to both drug-related immunosuppression or an associated drug (17). The prevalence of cyclosporin-induced gingival hyperplasia in renal transplant patients varies from 22 to 58% in different reports and is more common in patients with increased cyclosporin dosage, in those with increased dental plaque and gingival inflammation, and in younger patients (41). The incidence of tacrolimus-induced gingival hyperplasia in renal transplant patients is lower, generally between 0 and 15% (41). Although rare, uremic stomatitis is another clinical finding in advanced uremia; it consists of erythemopultaceous, ulcerative, hemorrhagic, and hyperkeratotic forms (42). The first two forms may occur as painful anterior mucosal lesions on the ventral tongue that usually heal spontaneously, after treatment of uremia (43). The hemorrhagic and hyperkeratotic forms may occur because of bleeding diathesis and long standing uremia, respectively (42). An intraoral form of “uremic frost” that can be observed in untreated uremia results from remaining urea crystals left on epithelial surfaces after saliva evaporation. Erosions of the dentition may occur because of regurgitation resulting from nausea (25). 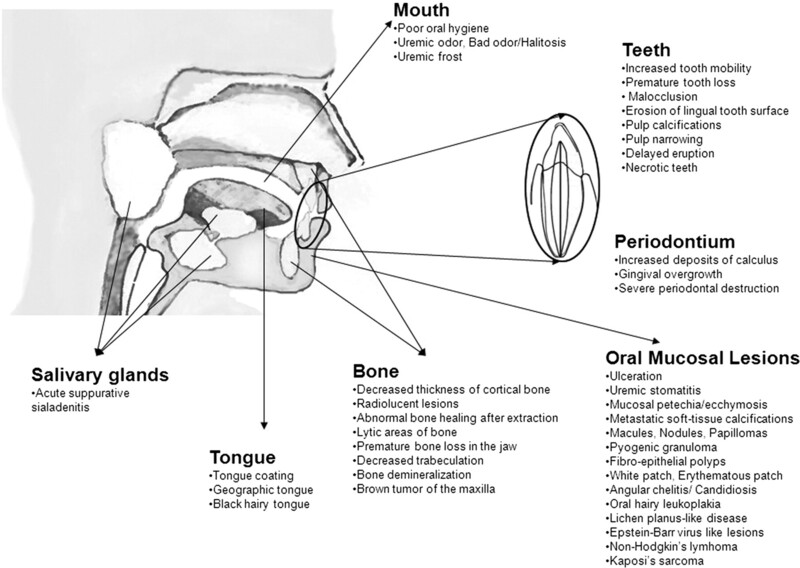 The manifestations of renal osteodystrophy in mandible, maxilla, and the oral cavity include demineralization, decreased trabeculation, loss of lamina dura, radiolucent giant cell lesions, macrognathia, metastatic soft-tissue calcifications, tooth mobility, malocclusion, enamel hypoplasia, and pulp stones (21,44,45). Gingivitis (defined as inflammation of the gingiva) and periodontitis (inflammation of the gingiva plus supporting tissues of the teeth) are common manifestations of poor oral health. Periodontitis represents a potential source of inflammation, and during the formation of peridontal pockets colonized with gram-negative anaerobic bacteria, an inflammatory cell infiltrate is recruited into the lesion that secretes proinflammatory mediators (41,46). Both gingivitis and periodontitis are seen more frequently in ESRD patients (47–49). Gingival hyperplasia is a relatively common periodontal complication in renal transplantation patients that has been attributed to cyclosporin dosage and the presence of dental plaques, likely contributing to gingival inflammation (50). Estimates of the prevalence of periodontitis vary across studies (Table 1): a 14% prevalence of moderate to severe periodontitis was reported among individuals >20 years of age in the United States population (51) and 13% of subjects had severe periodontitis in a normal Swedish population (52). This divergency in prevalence depends on methodological, etiological, age-related, racial, ethnic, socioeconomic, cultural, and behavioral factors that may be specific for each country. To exemplify this, although a Spanish report (27) showed significant higher plaque and calculus indices and lower salivary secretions in HD patients as compared with healthy controls, a report from The Netherlands (37) described comparable levels for most dental aspects. Undoubtedly, cross-cultural studies are needed on this neglected issue of dental problems in patients with ESRD. For comparative analyses it would be desirable to follow World Health Organization recommendations for a systematic classification on the basis of the severity of different aspects of periodontal disease including gingival index, papillary bleeding index plaque index, and clinical attachment level (53). The causes of increased periodontitis are not fully elucidated, but it has been proposed that repeated systemic anticoagulation may predispose HD patients to gingival bleeding and facilitate bacterial colonization (53). At the same time, oral barriers might have deteriorated because of disturbed humoral defense (46). Commencement of dialysis therapy appears to be accompanied by major changes in the oral condition (46), and therefore periodontal disease has been reported to progress in severity across predialysis, peritoneal dialysis (PD) and HD patients, respectively (53). Unfortunately, very few studies compared the prevalence of these symptoms between HD and PD patients. One study, however, reports periodontitis to be less severe in PD patients—and moderate in predialysis CKD patients—as compared with HD patients (53). Transplant patients were reported to have less halitosis when compared with HD, PD, and predialysis patients, leading to the hypothesis that specific uremic toxins may determine halitosis in the CKD population (8). Additionally, renal transplantation also enhances salivary flow and decreases symptoms of xerostomia and thirst (54). Several possible reasons have been proposed to account for the poor oral health in uremia that has been associated with immune dysfunction including defects in lymphocyte and monocyte function (41). Altered cellular immunity along with malnutrition contributes to a immunodeficient state in uremia. Uremic patients are more prone to bacterial infections because of malnutrition, which leads to a diminished ability to produce antibodies (35). In support of this, increased gingival inflammation has been reported in association with longer dialysis vintage (48), although this finding could not be observed in a more recent study (4). Because a strong association exists in the general population between diabetes and periodontitis (55), it has been proposed that the increased prevalence of diabetes in ESRD could also contribute to the over-representation of periodontitis (41). Psychological factors and depressive symptoms may decrease the priority of maintaining good oral health in ESRD population (11,16,41). Finally, secondary hyperparathyroidism has been suggested as a possible cause of peridontal disease in ESRD patients, but this has not been confirmed in recent exploratory analyses (56). A proposed model for how peridontitis could act as a potential cause of local and systemic inflammation in CKD patients is shown in Figure 1. At least two reports support the hypothesis that periodontitis may contribute to the systemic inflammatory burden in the ESRD population (48,57). Poor oral health status was found in 80% of 253 HD patients with periodontal disease and was associated with both high C-reactive protein and low serum albumin levels in univariate analysis but not in multivariate (48). On the basis of these findings, it is important to monitor and maintain the oral health status of patients undergoing dialysis, as well as in patients who are considered as potential renal transplant candidates. When a patient is considered for renal transplantation, ensuring healthy dentition becomes important because of the use of immunosuppressive drugs, which may further predispose to oral and possibly disseminated infection (11). Although a number of studies suggest that the oral hygiene status of ESRD patients may be worse than in the general population, only very few assessed the frequency of tooth brushing, flossing, and dental visits in these patients: tooth brushing was reported to be done once or more daily in 79% of the patients, less than once daily in 14% and never in 7% of the patients (11). The last dental visit(s) was reported as <1 year ago, 1 to 2 years ago, 2 to 5 years ago, and >5 years ago in 37, 20, 7, and 35%, respectively, among dentated dialysis patients. Another study reported tooth brushing frequencies as twice a day, once a day, irregular, and never in 14, 29, 40, and 17% of the patients, respectively (58). In a study comprising 86 dentated HD patients in whom sera were assayed for IgG-antibody levels to six periodontal species, the IgG antibody levels to Porphyromonas gingivalis were elevated in patients with systemic inflammation (57), leading the authors to propose such antibodies as a serum marker of destructive periodontal disease. Elevation of salivary macrophage inflammatory protein-1α, a chemokine that recruits osteoclast progenitors, was suggested as a biomarker of early events in inflammatory-induced periodontal bone loss that precedes radiographic evidence in carriers of Aggregatibacter actinomycetemcomitans, an oral commensal that can cause severe infections in the periodontium (59). Periodontitis represents a potential source of episodes of bacteremia, especially in the immunocompromised patient. This may not be surprising considering that the overall size of periodontal lesions may range from 1500 to 2000 mm2 (60) and that the number of bacteria can exceed 1 × 108 in a single periodontal pocket (61). Although bacteremia can occur after almost any type of dental manipulations including tooth brushing and flossing, these episodes are, however, usually transient and inconsequential for healthy individuals. In contrast, bacteremia in patients with dental caries and periodontal disease tends to be more sustained, raising the risk of hematogenous dissemination of the dental infection (62). Bacteria can adhere to damaged heart valves and cause endocarditis, and for this reason prophylactic antibiotics are recommended in patients with valvular heart disease (62). It is possible that the immune dysfunction in uremia (2) may substantially increase the risk for such systemic consequences of periodontitis and other oral pathologic conditions because we cannot fully explain why these patients suffer from such high rates of inflammation, infection, and CVD. Although links between oral health and infections have not been systematically studied, there are several reports in the literature. Bacteria from oral biofilms may be aspirated into the respiratory tract and may cause the initiation and progression of systemic infectious conditions such as pneumonia in high-risk subjects (63). A recent Swedish study showed that 32% of ESRD patients and 11% of healthy controls had fungal hyphae through microscopy on buccal smears (64). Clinical signs, including oral lesions associated with fungal infection, membranous candidiasis, erythematous oral stomatitis, and angular chelitis were found in 15% of the ESRD patients but not in the control group. Patients and controls with self-experienced mouth dryness were both likely to have fungal hyphae. Fungal colonization in the oral mucosal membranes may therefore have potential consequences like sepsis. In response to an infectious and inflammatory trigger, nonspecific innate and more specific adaptive immune responses occur (65). The innate immune system provides immediate protection against infection and inflammation by recruiting of immune cells, activation of complement systems, identification and removal of foreign substances, and activation of the adaptive immune system (66). However, in inflammatory diseases, the responses become chronic, and chronic diseases may develop because of repeated unchecked and maladapted inflammatory responses over the years (65). The earliest changes in atherosclerosis occur in the endothelium, leading to accumulation of monocytes and T cells, migration of polymorhonuclear leukocytes into the intima, differentiation and proliferation of the monocytes, and eventually development of fibrous cap. To examine the role of chronic bacterial infections as risk factors for atherosclerotic complications, the association between poor dental health and acute myocardial infarction was investigated in two separate case-control studies of a total of 100 patients with acute myocardial infarction and 102 controls (67). Dental health was found to be significantly worse in patients with acute myocardial infarction than in controls and the association remained valid after adjustment for age, social class, smoking, serum lipid concentrations, and the presence of diabetes (67). Poor oral hygiene, determined by the extent of dental debris and calculus, was associated with an increased incidence of coronary heart disease, and in men younger than 50 years at baseline, periodontal disease was a risk factor for coronary heart disease (68). Because periodontal disease and poor oral hygiene are associated with total mortality, assessments of dental health may be of value as a general indicator of personal hygiene and possibly health care practices (68). Patients with periodontitis exhibited dyslipidemia and increased nonfasting serum glucose levels compared with controls, suggesting a possible link between periodontitis, systemic inflammation, and a dysmetabolic state in otherwise healthy individuals (69). Thus, in periodontitis, overgrowth of gram-negative bacteria may cause endotoxemia and systemic inflammation leading to CVD (70). Periodontal disease may represent a risk factor for atherosclerosis and thromboembolic events (71). Periodontal treatment could reduce the risk of coronary heart disease and therefore become one of the preventing strategies (72). Oral diseases contribute to the elevated incidence of PEW in CKD patients (73), and proposed mechanistic links are summarized in Figure 2. All of these risk factors are interrelated in a vicious circle: whereas poor oral health may lead to both inflammation and PEW in CKD patients, numerous pathways associate the accumulation of proinflammatory cytokines with different aspects of PEW, including anorexia, muscle loss, low anabolic hormones, increased energy expenditure, and insulin resistance (74–76). Dryness, pain, or a bad taste in the mouth may lead to anorexia and nutrient deficiencies (77–79). Studies in the general population suggest that edentulous subjects are prone to have an inappropriate dietary intake (such as ingesting too little protein and too much calorie-rich, high-fat food) as compared with dentated persons. Whereas the number of teeth is of importance for masticatory function, having premolar and molar teeth (which help to occlude) is especially important for nutritional status. The increased periodontitis and dental caries rates of CKD patients lead to tooth loss, which may result in chewing difficulties because of inadequate occlusive surfaces or the limitations of prostheses (80). Noncarious tooth tissue loss is more prevalent in CKD individuals than in the general population (25). This was suggested by some authors as a possible consequence of secondary hyperparathyroidism leading to increased tooth mobility caused by excessive resorption of alveolar bone (14). However, this finding could not be confirmed in a more recent study (56). Severe hyperparathyroidism has been reported to alter the size and shape of the jawbone, which fails to return to normal contours even after parathyroidectomy (44). An association between the severity of renal dysfunction and the formation of dental calculus—an additional manifestation of disturbed calcium-phosphorus homeostasis—was reported in pediatric CKD patients in the predialysis stage, undergoing dialysis, or after kidney transplantation with healthy children as controls (81). The most abundant amount of calculus and the highest salivary urea level were found in the dialyzed children. These patients had the highest oral mucosal pH levels, most likely because of the abundant supply of urea from the salivary gland secretion, which after hydrolysis by bacteria leads to release of ammonia and elevation of pH in the dental plaque, further promoting calcium and phosphorus precipitation (81). Thus, retention of urea may facilitate dental plaque alkalinization, thereby contributing to a higher rate of calculus formation in dialyzed patients. In addition, the lowest salivary magnesium concentration was found in dialysis patients, and because magnesium may inhibit the calcification process, this may further explain the amplification of dental calculus formation in the dialyzed patients. Finally, this study showed that oxalate, which is retained in uremia, was a significant component of dental calculus in the dialyzed patients. Severe periodontitis and poor dental status were associated with low serum albumin levels and PEW in both HD and PD adult patients (46,82). A latter study in HD patients described signs of poor oral health status in 80% of the patients who often had severe periodontitis associated with both poor nutritional status and systemic inflammation (48). Certain medications like antidepressants, antipsychotics, antiemetics, and antihistamines can reduce salivary flow, creating the condition known as xerostomia. The risk for xerostomia increases with the number of drugs being taken and with increasing age (83). Because saliva lubricates and protects soft and hard oral tissues, helps soften foods, and facilitates swallowing (84), reduced salivary flow likely contributes to thirst and deglution problems, which may ultimately affect both satiety by water distension in the bowels and diminished nutrient intake in CKD patients. Table 2 summarizes medications that may potentially cause xerostomia (84,85). Of note, oral dryness and thirst decrease whereas salivary flow rates increase after renal transplantation (54). Approximately 30% of patients with advanced CKD are reported to have a “bad” or a “metallic” taste in their mouths, which has been associated with metabolic changes, diverse drugs, a reduced number of taste buds, and changes in both salivary flow rate and composition (36,54,86). Altered palatability issues may indeed modify the patient's perception of foods and influence choice. The severity of PEW in ESRD patients can also be aggravated by temporomandibular joint complaints, which are also relatively common in dialysis patients (37), perhaps as a consequence of renal osteodystrophy. Finally, an intervention program including oral cavity check-ups and education on oral health was associated with an improvement in the patient's nutritional status (87). The above-discussed sections describe several compelling reasons why it is important to improve oral health in the CKD population. 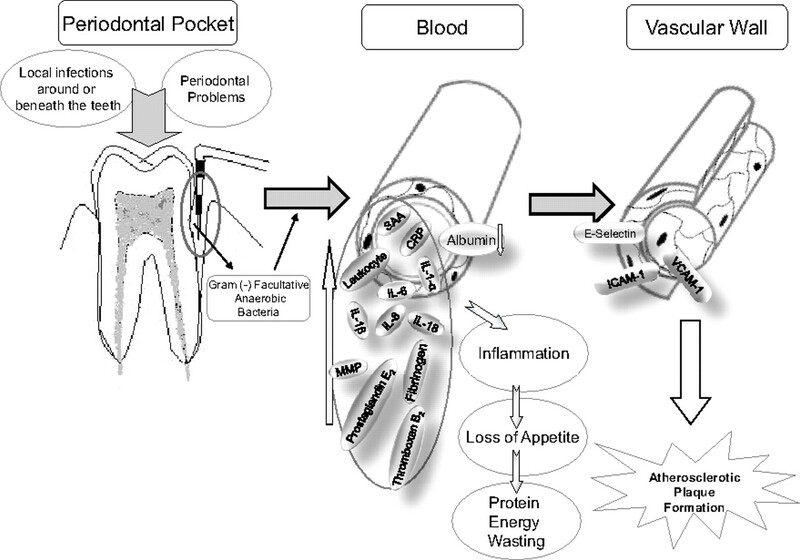 Namely, poor oral health in CKD patients relates to PEW and inflammation (46,48,82,87), and moderate-to-severe periodontal disease predisposes to CVD-related mortality five-fold (4). The higher prevalence of calculus in CKD patients may indicate insufficient oral care (37,88). Tooth brushing, flossing, and mouthwashes may reduce gingivitis (61), and oral hygiene measures, mechanical debridement, and/or surgery can effectively prevent the initiation and progression of periodontal diseases (89) (Figure 4). To reduce the risks of probing of periodontal pockets, prophylaxis with antibiotics should be considered (46). Prevention and treatment should aim at controlling the dental plaques and other risk factors, arresting progressive disease, and restoring lost tooth support with correction or replacement of defective prostheses (61). To maximize the effect of the periodontal treatment, patients should be encouraged to stop smoking. Advice to reduce the severity of xerostomia may include: avoiding mouth breathing; using a humidifier; avoiding tobacco, caffeine, alcohol, and mouthwashes containing alcohol; using sugar-free chewing gum to stimulate salivary flow; using saliva substitutes; and, if possible, modifying dosage of or changing xerostomic medications (83,90). 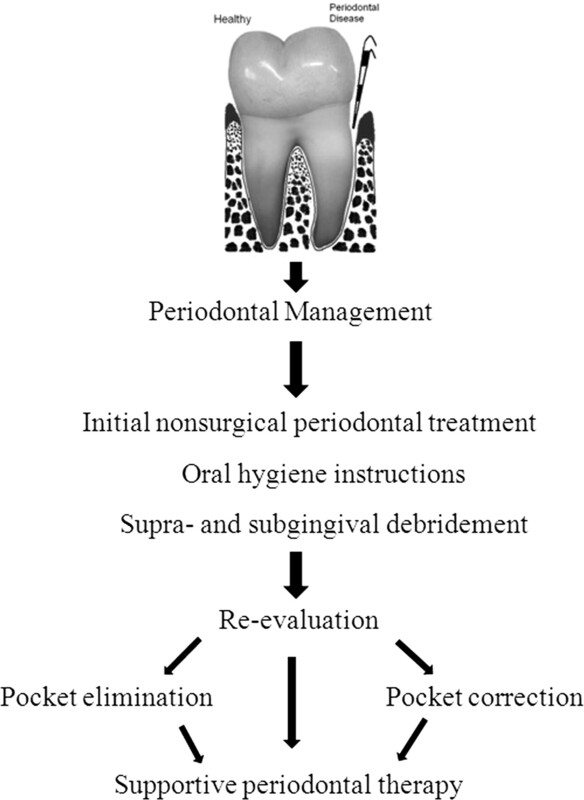 Suggested schedule for interventions and follow-up of periodontitis in chronic kidney disease patients. The periodontal treatment should be carried out as short treatment sessions on a dialysis-free day in hemodialysis patients. Note that antibiotic prophylaxis is necessary in transplant patients and is recommended in hemodialysis patients. Modified from Claffey et al. (89). ESRD patients have a complicated medical condition of which their dentists need to be aware; for example, patients may need antibiotic prophylaxis; local anesthetics with reduced epinephrine, especially in patients with hypertension; and withholding of anticoagulants/antiplatelet agents in conjunction with the dental procedure (11). There have been reports on the spread of hepatitis C in dialysis patients by dental surgery, suggesting oral instrumentation as a possible route of viral disease transmission (91). Therefore, careful surveillance in dental care is important in dialysis patients including awareness of a patient's viral status before oral instrumentation. Oral health is often poor in CKD patients and may contribute to PEW, inflammation, infections, and atherosclerotic complications, all of them important problems that would justify an increased attention to dental care and a better awareness in the clinic. Maintaining a healthy and functional dentition in CKD patients has an additional complementary role that most likely exceeds benefits seen in the general population. Poor dentition should be an alarm clock even at very early stages of CKD, in dialysis patients, and in patients undergoing kidney transplantation. Finally, unsatisfactory daily oral hygiene habits and insufficient awareness of the importance of oral health apparently warrants the common effort of both dentists and nephrologists. Bengt Lindholm is employed by Baxter Healthcare. Peter Stenvinkel is a member of the scientific advisory board of Gambro AB. None of the other authors have any conflicts of interest to declare. Harun Akar was supported by an ERA-EDTA Short-term Fellowship. The authors and some of the studies hereby presented also benefitted from Karolinska Institutet Centre for Gender Medicine, the Heart and Lung Foundation, the Swedish Kidney Association, Scandinavian Clinical Nutrition AB, and the Loo and Hans Osterman's Foundation. Baxter Novum is supported by a grant from Baxter Healthcare.